The 2016 Sunny Isles Beach Annual Jazz Fest will run Friday, November 18 through Sunday, November 20. Friday’s evening of Jazz is at Acqualina Resort and Spa on the Beach, Saturday’s main event is at the City’s Heritage Park and Sunday’s Jazz brunch will take place at Trump International Beach Resort. On Friday, November 18, Acqualina Resort and Spa on the Beach will host Opening Night for the 9th Annual Sunny Isles Beach Jazz Fest from 7:30pm to 11pm. Enjoy the sultry sounds of legendary jazz artist Brenda Alford while you savor a delicious, prix-fixe dinner from Il Mulino New York ($65 plus tax and gratuity). Guests interested in savoring the smooth sounds from the expansive bar area can reserve a spot for $25 (food and beverage not included). For reservations, please call Elizabeth Giordano 305.918.6843 or 305.466.9191 or email at egiordano(at)ilmulino.com. The City of Sunny Isles Beach hosts the main event on Saturday, November 19, featuring Michael Lington with guests Lourdes Valentin & Doug Walker, at Heritage Park, 19200 Collins Avenue. 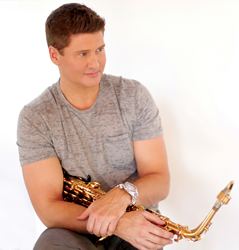 Michael Lington is a charismatic and soulful saxophonist who has touched the emotions of audiences worldwide for more than 20 years. With countless hit singles on the radio and 8 albums to his credit, he has performed for royals, presidents and as a special guest with Michael Bolton, Bobby Caldwell and Randy Crawford. Michael’s current album, “Soul Appeal”, has been number one on the charts for 16 consecutive weeks. His sales are Top 5 on iTunes and Top 5 on the Billboard Contemporary Jazz Chart. Guest performer, Doug Walker, is a Steel Drum Artist whose unique sound is influenced by jazz, salsa, reggae and rhythm and blues. Doug’s music “captures the flavor of his home,” Miami Beach. The third performer, well-known to locals, is Lourdes Valentin. Her training in classical, jazz, pop and musical theater gives her a unique perspective which she brings to every performance. Her spirit shines through in her music. This year the lawn seating on November 19 is provided at no cost to event goers; however tickets are limited and required. Obtain them prior to the show date. Tickets will be offered at the gate only if space is still available. Pricing is as follows: General Admission is free (ticket required, bring own chair or blanket), Reserved Seating is $10, and the VIP Ticket is $50 (includes beverages, food, & seating within the VIP area). To conclude the Jazz Fest on Sunday November 20, enjoy a Jazz Brunch at Neomi’s Grill - 2nd floor Trump International Beach Resort (18001 Collins Avenue). Details coming soon to sunnyislesbeachjazz.com. For more information, about Sunny Isles Beach Jazz Fest, tune to SIBTV on Atlantic Broadband Channel 77 (107-5) or AT&T U-verse Channel 99. Details, online ticket sales and alerts can be found on sunnyislesbeachjazz.com, or by following on Twitter & Facebook (@SIBJF). For questions, please contact Cultural and Community Services at 305.792.1706 or visit the City’s official website at sibfl.net.